On Thursday afternoon we spent an interesting half hour or so checking out the work that has started on the tomb of Agnès Sorel in the church of Saint Ours in Loches. Agnès was the mistress of Charles VII and the first French royal mistress to be publicly acknowledged and given an official position. The Lady of Beauty, as she is known, is being conserved on site, with a corner of the church transformed into a workshop. The idea is to clean and conserve the effigy and return the tomb to something more like its original appearance. The team of conservators is being managed by Olivier Rolland, who has also been supervising the stone conservation at the Chateau of Azay le Rideau. When we showed an interest and indicated that we knew a little about the subject he very kindly spent a few minutes chatting with us. 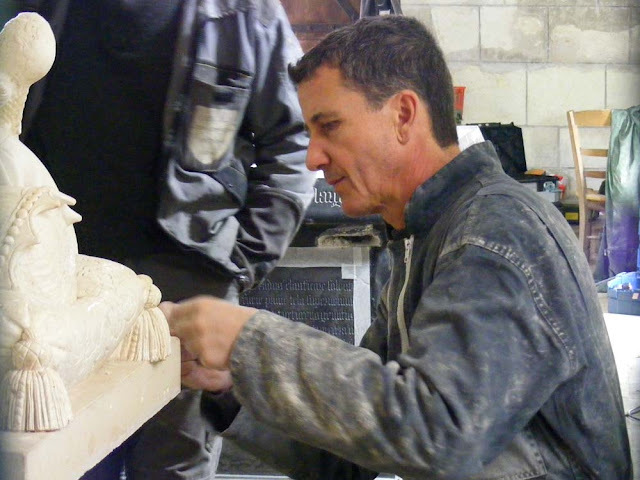 He couldn't talk about the project in hand, because all public statements about the work need to come from the Loches authorities, but he was happy to talk to us about stone conservation in general. Where I have quoted him below it is taken from newspaper reports on the project. 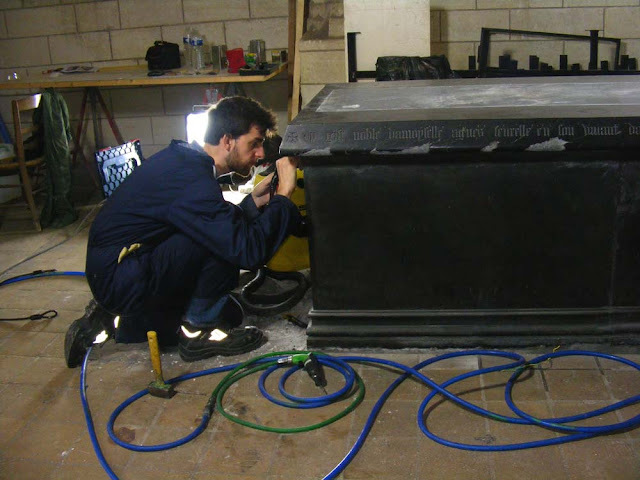 Sculpture conservation student Hoel Gaboriau at work on the black marble tomb. He also picked our brains about the nuances of the terms conservator, curator and restorer in English. He said he'd just submitted an article for a British conservation journal and wasn't sure how he should translate his professional title of conservateur-restaurateur*. Olivier Rolland discussing the work with someone from the Loches works department. 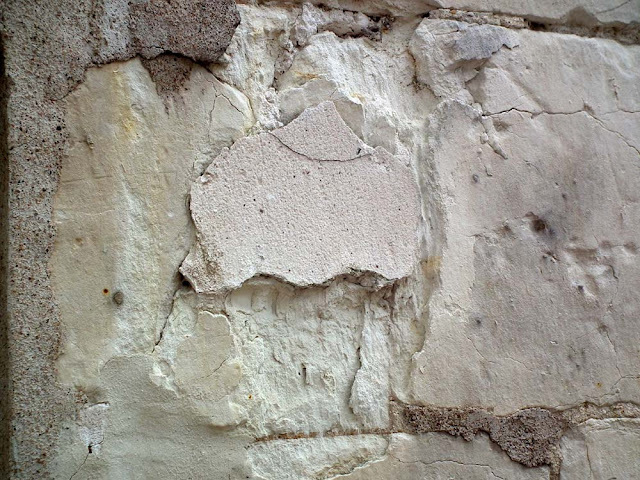 According to Olivier one of the greatest problems he has to deal with in stone conservation in the Touraine is the widespread use of plaster of Paris to repair external tuffeau (limestone) walls in the 19th century. He took us round to a wall by the side of the church to show us what happens after time. The problem is even worse than the use of concrete on tuffeau. The effect is similar, with the stone crumbling behind and around the hard layer of plaster, but plaster of Paris is much harder to identify and often requires a laboratory test. When we visited the effigy of Agnès had been lifted off the top of the tomb and was laid out on some trestles. Olivier was engaged in making an inch by inch inspection of the junction between the alabaster figure of Agnès and the slab of white stone she had been attached to in the 19th century. He says the work was restored in Paris between 1806 and 1809. It had been shattered by Revolutionaries who, coming from Indre, mistook her for a saint. The nose, the hands (which were originally holding a book) and the right elbow have been reconstituted. Olivier investigating the junction between the effigy and the stone slab. The conservator's job is to mitigate the effects of time, and to clean up the results of 'certaines incivilités'. For example, Olivier says someone thought it was a nice idea to place a candle on the effigy and it has scorched the head of one of the angels leaning over Agnès' face. I often come across flowers that visitors have placed on her as well, and these could easily leave stains. Even if they don't leave objects visitors are prone to touching her and even the cleanest hands leave a slight residue which is acidic, oily and will attract dust which can make an indelible mark over time, especially if many people touch the same place. Olivier showing the work to one of the curators from the Logis Royal and a companion. When both the tomb and the effigy are cleaned the sculpture is going to be replaced on the tomb, positioned centrally in the way shown in old drawings. This will be quite close to the way she looked originally, with the white sculpture contrasting with the black marble. She is going to be detached from the 19th century slab of white stone. Olivier wants her to give the impression she is floating, a bit like a ghost. The sides of the tomb are going to be inverted, as they were accidentally installed the wrong way up when the tomb was returned to the church in 2005. Finally, they will reconstruct the canopy above the head of Agnès and the two angels. According to Olivier the sculptor will work in the same manner as a medieval craftsman, using the same tools. The canopy won't be of alabaster, to avoid giving visitors the false idea that it is original, but perhaps in white limestone, to best evoke the original and not merely create a pastiche. A slab of marble will be placed in front of the canopy, as shown in the old drawings as well. My guess is that this reinstatement of the canopy will cause some disappointment if the angels are not moved to a position more like they are shown in the drawing. Visitors are already disappointed at how obscured Agnès' face is but my suspicion is that the drawing is not strictly accurate (the angels appear to be at two different points on either side) and they will not be moved up to enhance the view. A detail of a drawing of the tomb in the late 17th century, courtesy of Gallica, the Bibliotheque nationale's brilliant online service. The team of four conservators have estimated the work will take six weeks and they are expecting the unforeseen complications that are always inherent in these very delicate conservation projects. Olivier was dealing with one when we visited, and at least four interested parties from the Loches authorities and the Citadel came to have a look while we were there. Gypsum plaster and the damage it causes on a tuffeau wall near Saint Ours. Olivier clearly loves this monument. He says despite working on funerary memorials all the time you never lose your sensitivity to them. He finds such tombs very touching, and mentions the tomb of the children of Charles VIII in Tours cathedral, which he worked on prior to it going off to an exhibition in Paris, as similarly affecting him. Conservation Work - the team of four undertaking the work are Olivier Rolland, who is in charge, two independent sculpture conservators, Fabienne Bois and Emmanuelle Sédille, and a trainee, Hoel Gaboriau, a sculpture conservation student at the Upper School of Fine Arts Tours-Angers-Le Mans. 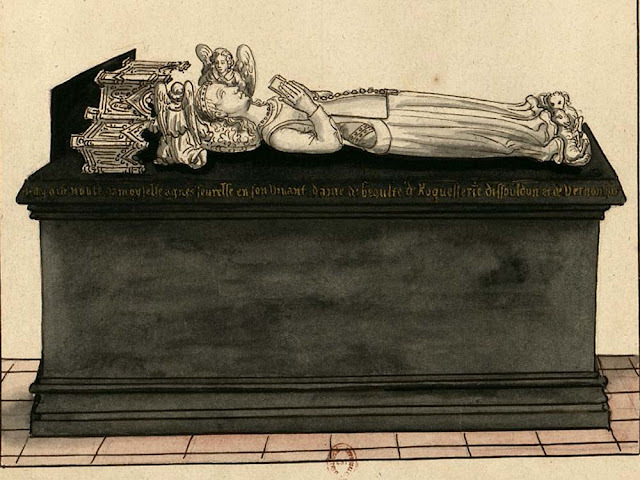 A Much Manhandled Tomb - at her death in 1450, the remains of Agnès Sorel were deposited in a triple coffin of oak, cedar and lead and transferred from Jumièges (Seine Maritime) to the collegiate church of Saint Ours in Loches. Her coffin was placed in a tomb of black marble. Even though Agnès had left a great deal of her estate to the canons, they asked Louis XI to move the tomb, which was situated in the middle of the choir of the church. Curiously (given that it seems likely he had her murdered) Louis ignored them, and it took until Louis XVI for the clergy to achieve their aim, in 1777. The tomb was then placed in the nave, but desecrated during the Revolution. The effigy was restored in Paris between 1806 and 1809, then installed in the Donjon up until 1970, from where it was transferred to the Logis Royal. In 2005 it was brought back to the church of Saint Ours. 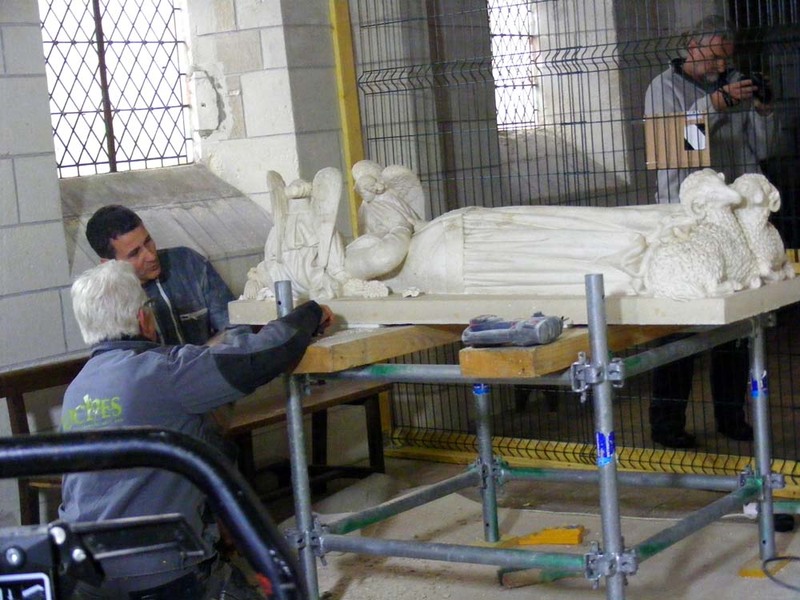 Financing the Project - the conservation of the tomb is an initiative of the town of Loches authority. The technical and scientific survey was overseen by Gilles Blieck, Curator for Historic Monuments at DRAC Centre-Val de Loire (regional cultural affairs department). 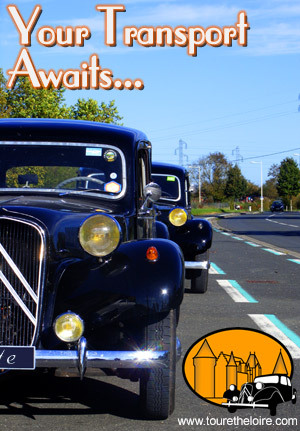 The work will cost €38 429.40 and at the last council meeting the heritage deputy requested a vote on asking for a grant from DRAC of 60% of the project funds. The remaining €15 371.76 has been donated by Loches Patrimoine et Culture so the project should break even for Loches council. Conservators and curators are specialists usually working with museum quality collections or objects, often in the public sector. A conservator's work is to consolidate and stabilise the condition of heritage objects, using the lightest possible touch, careful scientific methods and using only techniques that are reversible should best practice change with further research. A curator is responsible for the display, historical research and interpretation of museum objects. The monetary value of the objects they work with is secondary to the heritage value. Restorers are usually working for private collectors and their aim is often to return an object to 'as new' condition or maximize the auction value. Further Reading (not directly related to the project at hand, but worth reading if you are interested in heritage building and sculpture conservation). What's the difference between lime and gypsum plaster (Platre.com forum). The Use of Lime and Cement in Traditional Buildings (Historic Scotland Information for Historic Building Owners). Decorative Lime Plaster (by Trevor Proudfoot, Cliveden Conservation, for www.buildingconservation.com). Trevor is an ex-colleague of mine and I owe everything I know about stone and statuary conservation to him. Traditional Lime Plaster: Myths, Preconceptions and the Relevance of Good Practice (by Ian Constantinides, St Blaise, for www.buildingconservation.com). Sadly, I don't recall ever meeting Ian, but colleagues worked with him from time to time. The Use of Gypsum Plaster (by Tim Ratcliffe for www.buildingconservation.com). A la cuisine hier: A creamy chicken and bean casserole, with some of Simon's homemade homegrown tomato sauce, and served with his homemade naan bread. Caramelised figs with raw cultured cream and raspberry coulis. The figs came from Antoinette, who brought round a bag of twenty ripe little green figs from her garden. As I recall, she was given the manor of Beaute somewhere near Nogent sur Marne - thus her rather punning title. Yes, that's correct. The Chateau of Beauté was given to her, I think quite deliberately because of the name, by Charles VII. Richelieu demolished it in the 17th C, so it no longer exists.